The U.S. economy grew at a mere 1.8% annual pace in the first quarter, according to revised data released by the Commerce Department on Wednesday. Uh-oh. The U.S. economy suddenly looks weaker, after the government revised its data for the first quarter. Gross domestic product -- the broadest measure of economic activity -- rose at a mere 1.8% annual pace between January and March, marking a sharp downward revision from the 2.4% pace reported by the Commerce Department last month. The government revises its GDP figures several times, but economists weren't expecting such a dramatic change from the third estimate. "This was certainly unexpected and, I believe, rare," said Jennifer Lee, senior economist with BMO Capital Markets, referring to the revision. The weaker figures came primarily from revisions to consumer spending, exports and commercial real estate. Consumer spending, which alone accounts for roughly two-thirds of the GDP measure, rose at a 2.6% annualized pace in the first quarter, according to the revisions. 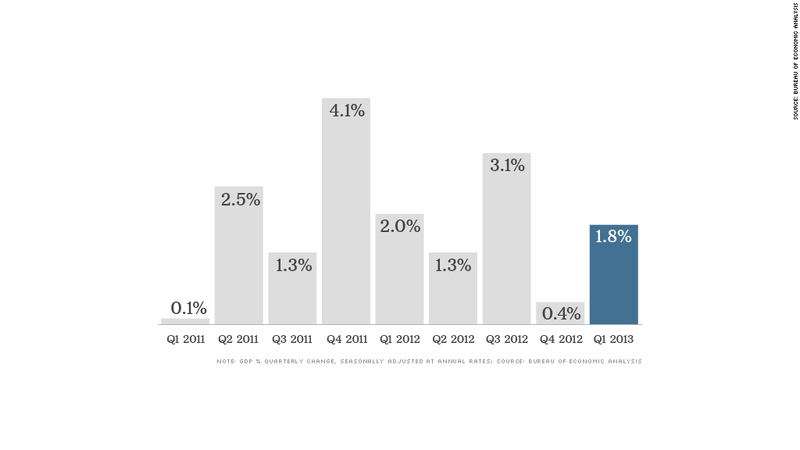 That's down from the 3.4% pace the Commerce Department estimated in its prior report. Meanwhile, spending on nonresidential buildings shrunk 8.3% in the first quarter, offsetting some of the economic boost from the ongoing housing recovery. U.S. exports to other countries contracted, and government spending cuts continued to be the largest drag on economic growth. Economists have already turned their attention to studying how the economy fared in the spring. Their estimates point to more of the same slow growth. Goldman Sachs (GS), Barclays (BCS), Nomura (NMR) and Macroeconomic Advisers economists estimate that the economy grew at a 1.5% to 1.9% annual pace between April and June. The numbers could change again next month. The Commerce Department is planning a complete overhaul of its GDP data, going back to 1929. That process, which is known as the "comprehensive revision," only happens every four to six years.